Pirates make good drinking friends, thems always having fun. We are an undead gypsy band that has traveled the world for centuries, bringing to you the type of entertainment you might not want to introduce to your mother. Or perhaps you might, you naughty thing, you! Marian von Gogu is the band’s leader, guitarist, accordionist and vocalist. Uncle Rasputin Popopovich is our bass player and currently the head of our sarcasm and witty retorts department. Måthías Árnrunrvedr Hákonan is the band’s percussionist, Gregor Koriatovich is our guitarist, and Pitor Petrokovich adds to the sound with his English Concertina. Callista Valarius finishes off the lineup with her sultry singing, and elegant dancing! We sing songs of travelling, drinking, celebration, revenge, cannibalistic vigilante-ism, and much, much more. 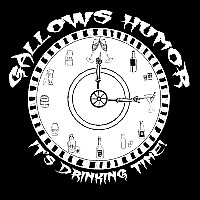 Gallows Humor Schedule – Esco Faire, Oct. 27-28.